ww2dbaseManton Sprague Eddy was born in Chicago, Illinois, United States. He attended the Shattuck Military School in Faribault, Minnesota, United States between 1910 and 1913. He enlisted in the United States Army in 1916 and served in France during WW1 as an infantryman of the 4th Division of the American Expeditionary Forces. With the war time rank of major, he served during the occupation of Germany until 1919. In 1920, he was reverted to the regular rank of captain. Between 1920 and 1934, he took the Infantry School Officers Course, advanced course, and the Command and General Staff School. On 23 Nov 1921, he married Mamie Peabody Buttolph. In the 1920s, he served as a member of the Infantry Board and an instructor of tactics at the Command and General Staff College, Kansas, United States. In 1941, he became commanding officer of the 114th Regiment of the 44th Division before taking command of the 9th Infantry Division and leading them through fighting in Tunisia, Sicily, and France. 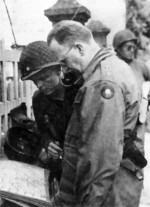 US Army infantry officer Lieutenant Charles Scheffel recalled Eddy as the officer who saved Patton from a bad choice of words on the eve of the Sicily invasion. ww2dbasePatton began an amazingly bellicose and agitated tirade about what we were going to do to the enemy when we got to Sicily. Then he said, "And gentlemen, when we land on the beaches of Sicily, there will be no prisoners taken." ww2dbaseI sat stunned in the first row of officers, not ten feet away from the pompous man. His words made my skin crawl. Nobody said anything for a long moment. ww2dbaseGeneral [Manton] Eddy stepped forward and tugged gently at Patton's shirtsleeve. "General," he said so softly I could barely hear him, "you might want to rethink your last statement." ww2dbasePatton looked out over the group of officers sitting on the sand before him. Then he wagged his hand toward us. "Forget what I just said." ww2dbaseIn France, Eddy won the Distinguished Service Cross for his leadership during the capture of the city of Cherbourg. In 1944, he was given command of the XII Corps, which fought in the southern front of the Battle of the Bulge. In Apr 1945, he returned to the US due to illness and largely ended his involvement in WW2. After the war, in 1946, he commanded the 3rd Service Command and Deputy Command of the 2nd Army. In 1947, he served as the Information Chief of the US Army. In 1948, he became the commanding general of the Command and General Staff College and was involved in developing modern US Army officer schooling programs. In 1950, he was nominated as a candidate to lead all US Army personnel in Europe, though did not receive the appointment. He went on to command the 7th Army. He retired at the rank of lieutenant general. Eddy passed away in 1962 and now rests in peace at the Arlington National Cemetery in Arlington, Virginia, United States. ww2dbaseBeyond the Distinguished Service Cross, Eddy's American awards also included the Distinguished Service Medal with oak leaf cluster, the Silver Star, the Legion of Merit with oak leaf cluster, the Air Medal, the Army Commendation Medal, and the Purple Heart. From the United Kingdom, Eddy was given the rank of Honorary Companion of the Order of the Bath. From France, he received the Legion of Honor and the Croix de Guerre. The Russians gave him the Order of War For The Fatherland and the Medal for Valor. From Belgium, he received the title of Commander of the Order of Leopold. 16 May 1892 Manton Eddy was born. 10 Apr 1962 Manton Eddy passed away. What a fabulous web site ! Time well spent in keeping up information on the most important war in history.